Grampus put in a much improved performance in the second leg of their quarter-final against FC Tokyo, but the 5-1 thrashing in the first leg proved too high a hurdle. Although manager Stojkovic made all the right comments after the game, I doubt he will be devastated by the failure to get through to the next final, and add yet more games to our schedule. In addition to adding Burzanovic to its roster, Grampus are said to be interested in Urawa's injury-prone Alex Santos. Hopefully, this is just a rumour since we have little need for an aging left back when we have Shohei Abe and Japan U-20 Masaya Sato. There is no need to splurge all of the Davi cash in one summer, unless we really do have someone like Marko Babić lined up. Grampus have announced that they have reached agreement with Red Star Belgrade, and will be adding Igor Burzanovic to the squad, subject to the midfielder passing a medical. It is nice to see that some of the profit they made from Davi will be used to strengthen the team. Despite Kei Yamaguchi having a good game against Urawa on Saturday, the midfield is an area where we clearly need a bit more spark. Hopefully, Burzanovic will provide it. Urawa's manager Finke was forced to eat his words (where he dismisses our new Aussie hero as a flash-in-the-pan), as Grampus' new strike force of Tamada and Kennedy demolish the Reds in front of 45,000 fans. You would think a supposedly experienced manager would have more sense than to motivate the opposition so effectively. Tamada, reveling in the space the Kennedy's presence, gave him, opened the scoring after Ogawa pulled a deep ball back from the byeline for Keiji to turn his defender as slot the ball under Yamagishi. Ogawa should have added a second later in the half, but his weak shot was easily saved. Tamada doubled the lead after a neat exchange of passes with Ogawa, firing an angled shot from the edge of the box that ricocheted in off the underside of the bar. Kennedy powered home a header, which proved too hot for Yamagishi to handle, from Magnum's excellent cross to complete the scoring. The Australian should really have added a second towards the end, a neat touch on the edge of the box sending him clear, but his scuffed shot dribbled past the far post. Our friendly neighbourhood wolf, Peter, gives us his take on Vissel's game against Omiya. Koumoto still in central defence, Miyamoto still in midfield. According to the shirt name, we now no longer have an Oukubo but a Yoshito. Park, Botti, Miyamoto, Kouga; Yoshida, Yoshito. 20 minutes gone, pretty even; Vissel a bit the livelier, but not necessarily superior so far. Yoshito has blazed two chances from the edge of the penalty area way over. The first was a lucky ricochet which left him running through but going a bit wide, the second was from a pull-back from Kouga on the left wing. 31' Uchiyama missed an open goal from a yard after a block on the line from a glancing header--over the top. 33' Yoshito beat the goalie to a ball outside the penalty area wide right, but the narrow-angle shot hit the outside of the near post. So it's Vissel creating most of the chances; but Ardija are not toothless. 35': Now it's Kouga's turn to miss a sitter, after Yoshito set him up at Kobe's left-hand post. 38' good move--a beautiful cross from Kouga headed just wide of the far post by Yoshito. A good effort. Good work by Yoshito had put Kouga away down the left. 40' a shot over by Ardija after a couple of corners. HT: As half expected, Vissel are finding it more difficult against a team happy to defend. They have not managed to look as good in midfield as they did in the last two games. Apart from getting offside once, Yoshida has been virtually anonymous. Ishibitsu, who the last couple of weeks after Yoshito looked the best player in the side, has not been so prominent this week. Maybe one reason is that Oumiya have done most of their attacking down their left--if this is a strategy to keep Ishibitsu quiet, it seems to have worked. Kouga has looked good today. 47' terrific save from Oumiya goalie after a great shot from Park from about 30 yards. GOAL: 50' sloppy give-away leads to a terrific 30-yard left-footer from Hashimoto, and the inevitable has happened: after missing so many chances Vissel are behind. The goal has put new life into Ardija. An Ardija forward has just headed over from about five yards when completely unmarked. penalty area, is allowed to get away a weak shot, which, for some unknown reason, Enomoto allows to go just inside his right-hand post. 62' Park out, Mogi in. 67' Yoshida out, Tanaka in. 74' Good save by Ardija goalie from a Kouga free-kick--but straight over his head. 76' Kouga out, Ganaha in. Kobe now have three forwards. accuracy when it really matters. GOAL: 89' Mogi takes it to the goal-line and squares it to Yoshito who scores from point-blank range. Kobe were better than against Shimizu. Rather than having no ideas, today's main impression was of a lack of technical skill. Kobe could not execute, either in scoring from good chances in the first half or in creating chances in the second half. Maketa. Gakkuri! But the main reason for being gakkuri is that once Oumiya were in front, Vissel didn't really look like scoring, so it was a bit of a surprise when they did. But, at least, they kept on fighting until the end. However, if Vissel are to avoid relegation they have to work on execution. their main relegation rivals. Regrettably, they looked the more decisive team. Given space Vissel look quite good, but when a team comes to close them down, they lack the precision to be convincing. I've just watched the highlights: Kitamoto looked like a sick carthorse as he trailed after the Ardija scorer Ishihara, who was just too good and fast for him, and other defenders were too slow to challenge Ishihara. As I've hinted before, Kitamoto is becoming a serious problem--not a good omen considering he's a sacred cow! It's difficult not to fault Enomoto on both goals. In defence, Vissel may be in trouble--a faltering centre-half and a suspect goalie. himself--and the other forwards find it difficult to hit a barn door with a banjo. The first half today was the story of half-a-dozen squandered goals. The Japan Times has an article by Andrew McKirdy on Nagoya's poor form over recent weeks. It highlights the test of Pixie's leadership as a manager, and lack of goals due to Davi not really fitting into the team's style. It fails to address the main problem, which is the lack of depth in midfield. We look short of ideas when Magnum or Ogawa are missing, or simply out of sorts. Former Liverpool striker, Roobie Fowler, scores his first goal for North Queensland Fury in a 2-1 loss to my home town team (Wolverhampton Wanderers). Another good performance from Wada's new-look Kobe sees them earn an unexpected point in Kawasaki. That point, along with JEF's loss to Sanfrecce sees Vissel climb back out of the relegation zone... just. They are still far from safe, but again showed that they should be able to play their way out of trouble. Although MIyamoto's spectacular bicycle-kick for the second equalizer grabbed all the headlines, the most reassuring aspect of this game was that Vissel did indeed come back after conceding goals to earn a well-deserved point. Grampus' new Australian forward, was an instant hit today. Scoring on the forty-second minute to give Grampus a half time lead. He linked well with his team mates, but a dubious looking penalty earns Kyoto a point. Jesus got off to a good start, even if he was unable to get off to a winning start. His relaxed nature during the warm-up, which saw him trot down to the home end to greet his new fans, and positive contribution to a much improved team performance bode well for the future. On this showing, he may well be more reliable and effective than even Frode Johnsen was last year. The first half saw Grampus using the wings much more effectively than they have recently. Kei Yamaguchi, Naoshi, and Shohei Abe all making effective forays down the flanks early on. Kennedy not only proved a useful target i the middle, but also shielded the ball well when he dropped back into deeper positions, and was able to lay the ball off to a team mate. He also showed some neat touches on the ball, with one drag-back outfoxing the two Sanga defenders trying to close him down. He also almost released Magnum through the middle with a deftly pass that saw a desperate lunge make just enough contact with the ball to avert the danger to Mizutani's goal. Indeed, Sanga did not manage to threaten Grampus until a predictable Masukawa slip gifted Yanagisawa a rare sniff off goal after 25 minutes. The lanky Aussies first clear chance to open his account came in the40th minute, when a header from a Tamada cross drifted just over the bar. However, the big man made no mistake two minutes later, when a glancing header from Magnum's angled ball into the box, gave the Sanga 'keeper not chance. Nagoya 1-0 up and looking much the better team, with Sanga struggling to contain the Australian forward and posing only the occasional threat. The second half saw former Grampus favourite, Yohei Toyoda, replace the ineffective Ando, but he was unable to alter the balance of the game. Nagoya continued to dominate possession and the chances. Magnum saw an early header under pressure drift over the bar, and almost connected with a ricochet from a Tamada effort a few minutes later. Tamada and Magnum almost engineered another goal midway through the half when a neat series of passes gave Magnum a clear sight of goal. His effort was blacked, but the loose ball fell to Tamada, who sliced the rebound wide. Sanga finally got into the game on a more consistent basis when Paulinho, who had replaced Nakatani after 10 minutes of the half, agan to exert his influence. After several bursts into space in the box, he finally induced a challenge from Narazaki that won Sanga a dubious penalty. There was little, if any, contact by the Grampus custodian, but his outstretched arms were invitingly there to fall over. The crafty Brazilian made no mistake in doing so in spectacular style, and duly converted the kick. Grampus pressed forward in search of a winner. 'Jesus' saw a header from an Ogawa corner drift wide and a close range shot parried by Mizutani as time ran out, but was unable save the team from two dropped points. However, it looks like he may well help the team turn its season around, and should certainly earn an extension of his six-month contract if he continues to play as well as he did yesterday. The Sporting Life is reporting that Japan international Keisuke Honda may sson be swapping the yellow shirt of VVV Venlo for that of another team. If previous reports prove accurate, then PSV or Ajax seems the mostly likely destination. Unfortunately, the soon to be departed Davi started the game and was not replaced until half time. By which time, a shell-shocked team was already 4-0 down to the rampant Gasmen. It will require a spectacular debut by Joshua Kennedy to lift the team's spirits. Grampus newcomer, Joshua Kennedy, made it three goals in three games as he scored a first half goal in Sunday's practice game against Tokai Gaguen University. All three games have been against university teams, but he has bagged first half goals in every game he has played so far. A trend we hope to see him continue against Kyoto next week, when he is expected to make his official debut. Red-hot winger, Naohiro Ishikaawa, added another goal to his tally, making him joint top scorer in the league. A low shot into the far corner giving Narazaki no chance, after Ishikawa was allowed to run at the defense. Cabore added a second, when he tucked home a spilled save by Narazaki later in the half. The presence of gentle giant Sota Hirayama in the Tokyo forward line, saw Nagoya's own gentle giant, Takahiro Masukawa, return to the heart of the defense, after missing the last game through suspension. However, Tokyo's pace always had Masu and Grampus on the back foot, and Narazaki was forced to make a couple of excellent saves to keep the score to a respectable level. Even so, there was little he could do when Sauzuki was also allowed a free run into the box, later in injury time, to fire home Tokyo's third. This game saw youngster Sho Hanai make a rare appearance as a substitute, but had to withdraw injured after only 15 minutes. Otherwise, it was the same old faces failing to impress. After Sato's successful start last week, we were hoping to see some other fresh faces today. Hopefully, one or two will get their chance in the Nabisco Cup game on Wednesday. It was also Davi's last league game in a Grampus jersey, as the yellow card picked up in the first hale, rules him out for next week's encounter against Sanga. Although the team put in a much improved performance for Masahiro Wada's second game in charge, Kobe fall into the relegation zone as JEF get an unlikely point. Despite the failure to get three point from this game, we saw indications that the team should be able to climb back up the table and escape danger. With half the season left to go, there is no need for the team to panic, and should be able to play itself out of trouble. The main surprise in Wada's team selection was the inclusion of Miyamoto in a midfield role. The former national team captain looked comfortable in this role, and it leaves a apace for the more agile Komoto in the centre of defense. (Tsune's lack of speed can prove to be a liability, no matter how much experience and guile he brings to the back line.) And it it was a Miyamoto pass that helped start the move that lead to Park's well-taken goal towards the end of the first half. JEF have the heroics of 'keeper Okamoto to thank for keeping them in the game. Davi Headed to Qatar for 500 Mil. Local sources say that it has cost Umm Salal 500 million yen to buy out the remainder of Davi's three year contract. They also say that he will be getting a big pay rise, jumping from the 40 million yen he was reportedly getting from Grampus to 140 million at Umm Salal. Let's hope that the club use some of that 500 million that are getting on a creative midfielder. A much improved performance from Ngaoya sees them play their best game for several weeks. Despite the absence of our two established central defenders, the back line, ably lead by Takeuchi, looked surprisingly confident and assured. Masaya Sato is certainly good enough to use as a stand-in central defender, and both his and Takeuchi's side back experience means that they are quicker to move the ball upfield or down the wings. The 4-3-3 formation employed, with Ogawa playing a more defensive role, also saw the team create many more chances than they have of late. It also Nakamura play a much better and more positive game. Although he faded a bit as an influence in the second half, it looks like this formation may well serve the team better than a more rigid 4-4-2 formation. The first half was a fairly even affair, with both teams creating several chances. Apart from Leandro's goal after eight minutes, where Takeuchi hesitated to challenge Futagawa in the build-up, which allowed him to release Leandro through the middle, both he and Sato coped well with Gamba's probing. Although Masaya was caught out by Leandro's quickly taken strike, he read the the game well and made some timely interceptions later in the game. At the other end, Davi and Tamada both tested the Gamba defense with their ability to run at defenders. And in Magnum they found a reliable source of supply of passes, although the Brazilian still looks a bit off the pace he is getting back to full fitness and form. The second half followed a similar pattern, apart from 10-minute spell early in the half when Gamba looked set to gain the ascendency. During this period Leandro saw a glancing header slip wide, when he should have hit the target. Fortunately, Grampus got back into the game shortly after this and Matsuyo was forced to make a fine save from a Magnum shot, which he turned onto a post. Tamada also had a great chance late in the game, bursting though after a neat flick by Magnum near the edge of the box. Grampus won the game in dramatic fashion, when Maki was presented with ball, after a wayward pass by Matsuyo, and gratefully slotted home from a tight angle. The win sees them rise to 9th, and gives the manager a bit more breathing room to blood some more of our youngsters. Sato has proved conclusively that he has what it takes to succeed, and should set an inspiring example to some of the other youngsters struggling to break into the top team. He certainly looked an adequate replacement for the missing Bajalica, and offers the team some flexibility since both he and Takeuchi can operate as either s side back or in a more central role. 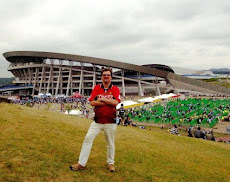 All in all, it was good day to be Grampus fan, after a turbulent few days. The Nagoya manager was forced to employ young side-back Masaya Sato in an unfamiliar central defensive position against Gamba last night. The youngster emerged on the winning side, in his first league start for the club. A result that suggests that Masaya should get to start when he does play, rather than come on as a substitute. It would certainly be easier for Sato to start games, rather than have to adjust to the pace of a game when coming on midway through the game, and he has certainly earned the right to get occasional starts to gain experience. Although he is a side-back, he first and foremost needs to be able to defend. If he can gain that experience as an occasional central defender, it should stand the team in good stead later in the season when the tough schedule demands that Pixie juggle the defensive lineup. Vissel Kobe sank closer to the relegation zone on Saturday, as they were eventually outclassed by FC Tokyo. Although they started brightly, and for 20 minutes or so they managed to hold their own, once the visitors got into their stride, it was all one way traffic towards the Vissel goal. A decent crowd of 15,000 turned up to watch Kobe take on high-flying Tokyo, in Masahiro Wada's first game in charge. It was to prove a harsh lesson for the new manager, as the lack of match practice for Ganaha and Botti became apparent as the game wore on. Both the underused Ganaha and the returning Botti look as though they need another game or two to fully adjust to J1 level again. Kobe fans will certainly hoping they do so soon, before the club become engulfed in a full fledged relegation battle. Another Brazilian Jumping Ship for the Middle East? Since Davi almost jumped ship even before he even touched down in Nagoya, it is no surprise that he and his agent have been scheming to set-up a lucrative move to the Middle East. However, despite the team not playing a style the makes the best of his talents, Davi does work hard for the team but tends to try and do too much by himself. The arrival of Josh Kennedy should free Davi to play his natural game, if decides to stay and make help us win this year's ACL. Nagoya manager, Dragan Stojkovic, is facing his first real test as a manger, after last night's 0-3 home loss to Kashima. A result that sees the team fall to its fourth league loss in a row, and drop out of contention for even an ACL berth (top three finish). It is time for some harsh lessons, for some of the so-called regulars. While the lack of depth in the squad made a degree of fatigue entirely predictable, the departure of Bajalica (to look after his sick mum in Serbia) and injuries to Tamada and Magnum exacerbated the team's tiring schedule. A situation made even more distressing by the complete loss of form by Naoshi Nakamura. With Kennedy already in Japan and preparing for his debut (the moment his visa comes through), and hopefully and replacement for Bajlica, the team should be in a position to bounce back up the table in a week or two. In the meantime, however, it could time to inject some fresh blood into the team by giving the likes of Hanai, Fukushima and Sato a run in the first team. The club, and the youngsters themselves, are not going find out if they can make the grade by sitting on the bench all the time.